Great eLearning starts with getting the basics right. That means investing in the best tools for your business. First, a powerful learning management system (LMS) needs to be checked off your list. Then, if you're using SCORM or xAPI course content, a first-class authoring tool is a must. Whether you’re new to the world of authoring tools or in the market looking to upgrade, we’ve collated a list of some of the best tools out there. We deep-dive into the pros, cons, features, and more of each to help you find the best eLearning authoring tool for you. So, what are eLearning authoring tools? An authoring tool is software that allows you to create and arrange content into a standardized course structure that can be exported in a number of different multimedia types. For those in eLearning, the most common output is to the SCORM format. 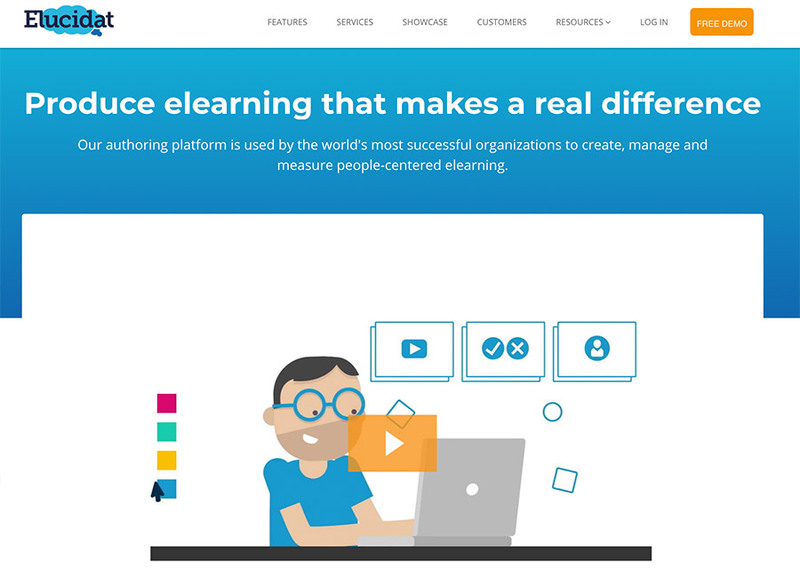 LMSs, like LearnUpon, are compatible with SCORM 1.2 (yup, there are multiple versions). With LMS authoring tools, you get a handy zip package that easily uploads to your SCORM compliant LMS. A well-known name in the world of authoring, Storyline is clean, modern, and has plenty of powerful features. For example, it allows you to storyboard your courses and then dictate the path that your learner takes. And although it can take a little bit of time to get to grips with Storyline, that’s balanced by the quality of the results. 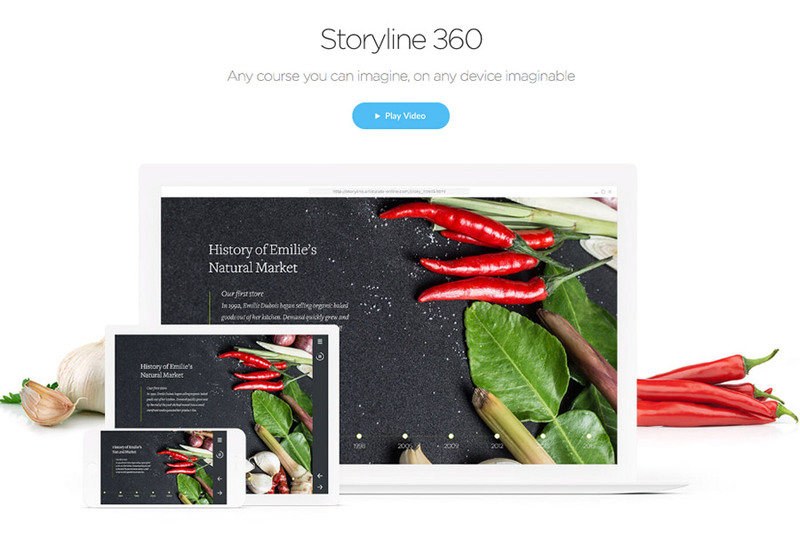 The platform has two pricing options for you to choose from: a Storyline 360 subscription or a one-off purchase of Storyline 3. The website has a helpful comparison chart that details what comes with each option. The subscription is probably the better choice as it gives you access to a host of other apps to use and the benefit of regular updates, but either option is worth a try. The sibling to Storyline, Rise 360 is another top quality authoring tool from Articulate. With a prime focus on mobile-responsive content, it's a smart choice for those who want courses that are compatible with every device. Again, like Storyline, it has a clean, modern interface that delivers visually pleasing results. Captivate is one of the most feature-rich tools, especially when you take into account its interoperability with other Adobe tools. We like that you can storyboard your courses and utilize advanced transitions and triggers - the result of which is engaging content for any scenario or subject. The PowerPoint integration is a must-use feature for anyone with content in this format as it fast tracks your course creation process. Elucidat is a cloud-based authoring tool that focuses on simplicity. But, that doesn’t mean that it’s light on features. It’s a user-friendly option that is tailor-made for collaboration. Think Google Docs - multiple people working on content at the same time, without worrying about version control etc. Content is responsive to all screen sizes, so it’s ideal for mobile learning. And the WYSIWYG (what you see is what you get) interface makes adjustments a piece of cake to carry out. iSpring’s big draw is that it takes PowerPoint content and converts it to eLearning courses. So, it’s super simple for those new to SCORM to understand and execute the process. As well as slides, you can incorporate video capture, interactions, and assessments to build engaging content. The data generated is then fed into the reporting suite of your LMS. One thing to note for Mac users - there’s no dedicated version for your machine (unless you install Windows on your Mac). First and foremost a video capture tool, Camtasia content can be exported as SCORM packages. It’s an excellent option if you want to jazz up PowerPoint presentations as you can effortlessly record narration and even your face simultaneously. It may be a lighter option than the others listed, but it benefits by being highly accessible and affordable. Just be sure to test the reporting output on offer so you know it meets the requirements of your organization. Another authoring tool with a strong focus on smooth collaboration, Composica enables you to work with your colleagues in a straightforward way. You can add different users, assign tasks, and always have the most up-to-date version of your content at hand. It also has competitive pricing so it's a relatively affordable option for your business. If you’re looking for a simple, yet powerful authoring tool Knowbly is one to check out. It’s got all the features an eLearning newbie needs like drag and drop content creation, quick customizability, mobile-responsive, and more. The platform also enables you to easily organize all of your content within one system so you’ll never lose track of any of your assets. Both a cloud and Windows-based solution, Lectora is an eLearning authoring tool that works well for SCORM content. A neat feature is that it integrates with Camtasia and Snagit. This means that making screen recording, image editing, voiceovers, and more is that little bit more simpler. Self-described as "mobile-first", Gomo is another simple to use authoring tool. It's a recommended solution for beginners wanting to optimize their content to be mobile-responsive as it has a drag and drop interface. Another bonus for beginners, it has media assets on offer that are visually attractive and can help you make your content more engaging. Described as "all-in-one eLearning software", Easygenerator has lots of impressive features to help you make engaging content. It's another top option for newbies as no coding is needed. And it's super user-friendly so you can handily create your content. 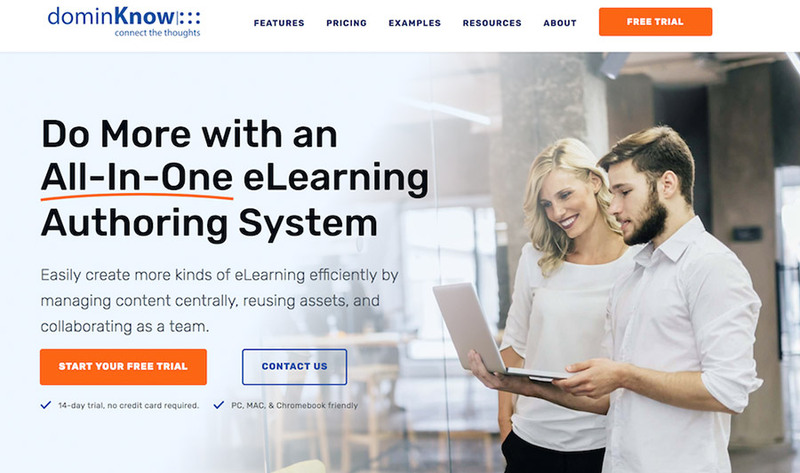 It’s also an LMS authoring tool that's compatible with most solutions, meaning you shouldn't have any issues using this with your preferred platform. DominKnow ONE is a diverse authoring tool that can help you make lots of different types of content. As you’d expect, it works well at making mobile-responsive content and it’s very convenient for teams to use while working together. Content is also simple to publish and distribute, and with everything in one place, it’s effortless to keep track of all of your course content. Cost: Find out the pricing structure and different pricing models available to you, as well as what features are attached to each. Customer Support: Never underestimate the value of great support. Do your research into how the tool supports you and during your free trial test the support to see how responsive each tool really is. You don’t want to be left alone with a problem! Documentation/Guides/KnowledgeBase: If you need information, it’s crucial that you know where to go and that it’s easily accessible. Ask your potential authoring tool vendor about the resources available to ensure you can get the answers you need. Features: It’s always a good move to make a list of “must have” and “nice to have” features and ask your potential vendor about each one of them so you can quickly rule in or rule out options. Ease of use: Remember, an authoring tool should help you make content quickly and easily, not slow you down. Ensure your solution is simple to use so you can efficiently build the content you want. Our last tip, when in doubt, try it out! If the authoring tool has a free trial, make the most of it. It’s the best way to find the ideal authoring tool for your content.